Ground- and space-based observations, including studies by ESA's XMM-Newton X-ray observatory, have provided unique insights into a star system dominated by two Galactic giants. The region under scrutiny, known as Cygnus OB2, is a huge cloud of interstellar gas and dust. Approximately 4700 light years from Earth in the constellation of Cygnus, it is home to about 100 O class stars - some of the most massive and most luminous stars known. These extremely rare, blue-white stars, which are typically 50 times the mass of the Sun and five to 10 times hotter at the surface, have extremely short (by Universal standards) and violent lives. Like gigantic furnaces that are out of control, they consume all of their hydrogen and helium fuel within a few million years. Simulation of colliding wind binary. Credit: Australian National University/E.R. Parkin, University of Liège/E. Gosset. Click here for more information on this video. As the nuclear fusion in their cores progresses, ultraviolet and X-ray radiation pours into space, heating and energising any nearby interstellar material. Enormous amounts of material are also blasted into space in the form of stellar winds. These winds come from material "pushed" away from the stellar surface by the pressure from the starlight. The stream of energetic particles – mainly protons and electrons – is 10 times faster and tens of billions of times more massive than the solar wind. In an effort to discover more about these mysterious objects, an international team of astronomers has been focusing its attention on a pair of O stars, known as Cyg OB2 #9. Although the system has been known for many decades, the binary nature of Cyg OB2 #9 has only been proved in recent years. Key clues came with the discovery of periodic variations in its radio emission on a timescale of 2.355 years, combined with a clear doubling of spectral lines. Continued monitoring of the system indicated that Cyg OB2 #9 is composed of two nearly equal-mass objects which follow a very eccentric orbit around their common centre of gravity. Analysis of previous XMM-Newton observations revealed no unexpected features in the spectrum, although the data were obtained when the stars were far from each other and any interaction was relatively weak. Only some unusual, small changes in the X-ray signature hinted at the presence of colliding stellar winds. 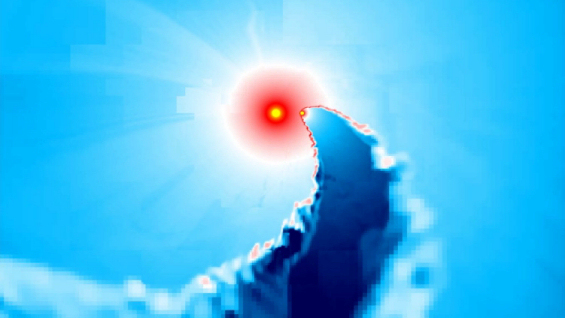 In order to better understand this system and the likely head-on collision between their winds, the team decided to conduct a dedicated monitoring programme that coincided with the periastron (closest approach) of the two stars in June-July 2011 - the first opportunity to do so following the discovery of the binary system. The campaign was organised to observe all aspects of the event: monitoring of radio emission using the Expanded Very Large Array; refining the orbit of the two stars using the CHARA optical/infrared telescope array; spectroscopic monitoring in the optical with the OHP-Sophie and WIRO spectrographs to further tie down the orbit; and X-ray studies to detect and understand the high energy emission from the collision between the winds blowing outward from each star. Simulation of the orbits of the 2 massive O stars in Cyg OB2 #9, and the XMM-Newton and Swift observations of X-ray emission from this binary system. Credit: NASA/GSFC . Click here for larger versions and more information on this video. Five sets of X-ray flux observations were carried out with NASA's Swift orbital observatory during 2011, in order to monitor the stars for 10 months around the date of periastron. Full monitoring of Cyg OB2 #9 with XMM-Newton was not possible, but a high resolution spectral observation was made near the predicted time of the periastron passage. "These were difficult measurements to make since they had to be made when the two stars were orbiting closest to each other," said Yael Nazé, a FNRS researcher at the University of Liège, Belgium, and lead author of the paper which has been accepted for publication in the journal Astronomy & Astrophysics. "Thanks to radio and optical data, we knew the orbital period was about 860 days, so we could precisely schedule observations around the time of periastron. In light of our refined orbital solution, Cyg OB2 #9 appears to be a massive O+O binary with a long period and high eccentricity. Its components have similar masses and similar luminosities." The new X-ray data also provided the first concrete evidence that a wind-wind collision is taking place. Two sets of measurements taken 5.5 days apart around the time of periastron - one by XMM-Newton and one by Swift - showed a quadrupling of the X-ray flux when the stars were closer together. "Cyg OB2 #9 displays long-term variations which coincide with the timescale of the orbital period," said Yael Nazé. 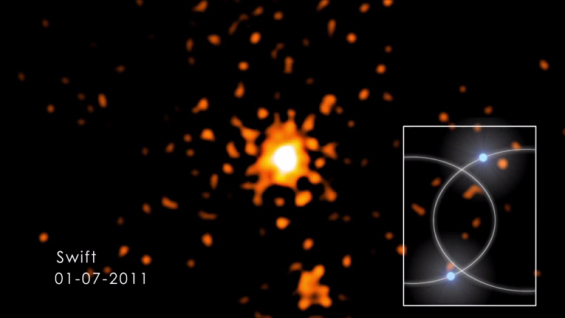 "The colliding winds of the two stars generate very hot gas, which in turn emits X-rays. Close to the stars, the winds are denser, hence the collision is expected to be stronger. This is exactly what is seen in the data, so we believe it supports the presence of a wind-wind collision in the binary system. "Overall, Cyg OB2 #9 seems to be the first example of an undisturbed colliding wind system involving two ordinary, massive stars." Such studies are important because, unlike Cyg OB2 #9, many massive binaries show no signature of colliding winds. Understanding why will improve scientists' knowledge of collision mechanisms and stellar wind properties. This, in turn, will improve understanding of how massive stars evolve and how they interact with their immediate surroundings and with the Universe as a whole. "The winds of massive stars have a profound impact on their environment," said Norbert Schartel, ESA's XMM-Newton project scientist. "Together with supernova explosions, the winds inject new elements into the interstellar medium, shape molecular clouds and trigger new star formation." "There are currently intense debates in the massive star community about wind properties," said Yael Nazé. "To gain a better insight into the evolution of distant galaxies where individual stars are not detectable, it is important to know about winds in detail. "Since the nature of its wind-wind collision remains identical throughout the orbit, Cyg OB2 #9 represents a milestone in our understanding of massive star winds." The XMM-Newton observations were carried out using the three European Photon Imaging Cameras (EPIC); these detect X-rays in the energy range of 0.2 keV - 10 keV. Observations of Cyg OB2 #9 were also obtained with the Swift X-ray Telescope, covering a range 0.5-10 keV, with the high-resolution echelle spectrograph (SOPHIE) on the 1.93m telescope at the Observatoire de Haute-Provence, France, and with the Wyoming Infrared Observatory (WIRO) longslit spectrograph, USA.